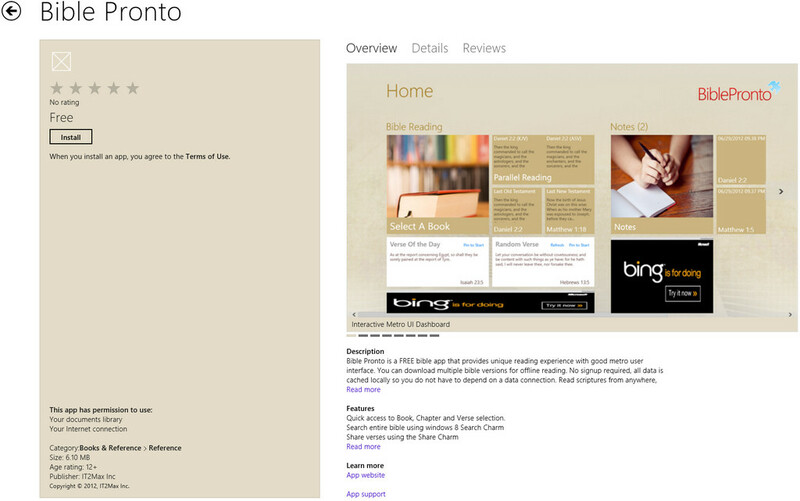 Bible Pronto updated to ver 1.1 includes new features, UI improvement and bug fixes. In Version 1.1 we have added features, bug fixes and included performance fixes. We have completely reworked the bible reading experience to support full panoramic reading taking full advantage of your device resolution and form factor. This fix is also applied to the parallel reading mode. App now works in both Landscape and in Portrait modes automatically scaling to the device resolution. Added SkyDrive Backup and Restore feature. Now you can backup your Notes, Bookmarks and highlighted verses to the cloud to get complete roaming experience on any device. Added New English Translation to the Bible Version. Please use the settings charm to manage your local Bible versions. Sync the bible version first and download. Pinned verses now directly open the scriptures in reading mode. – More versions coming soon…. We commend IT2Max with this whopping feature update. I am sure Scripture lovers around the world will appreciate the added features. Fetch the update from the store and let us know what you think of these new added features. We will love to hear about new features you want in this app. Suggestions, feedback welcome. Thanks, the update is looking awesome at my end here. really love it. Tried to backup to Skydrive though, and got warning the app need access to my profile contacts details, and the right to view and modify my documents and photos. Got unnerved by that. Why does the app need so much rights on SkyDrive? 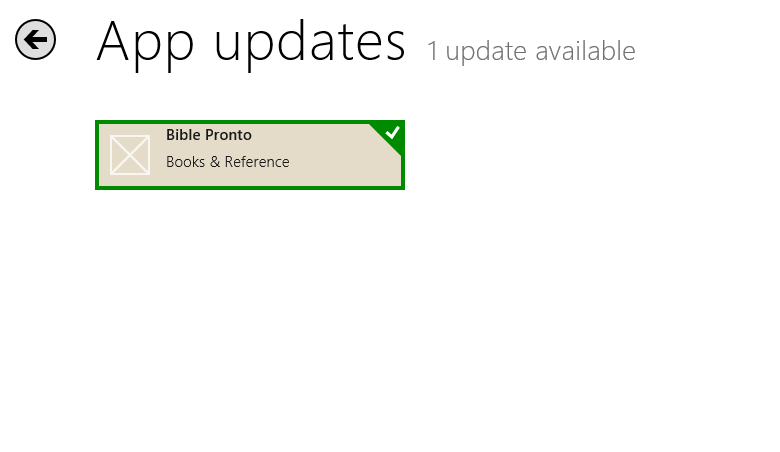 I just want it to write and read to the BiblePronto folder on SkyDrive, not mess around with my profile and data. Waiting for your response before posting that detail. Please reply. Thanks. That is microsoft’s default behavior when we try to upload anything to SkyDrive. If we need write permission on User’s SkyDrive folder it adds that message. We will try to work with Microsoft to see if there is any fix to it. Aah OK. I will re-initiate backup again. MS should allow access per app folder and not the whole SkyDrive. That way they can be sure apps are not going to have more access than is needed. Version 2.0 RTM version is in certification process. Includes audio bible for KJV and other performance improvements. Better notes and bookmark management. Ad supported to bring more copyrighted bible versions. Fantastic News! Can’t wait to give it a spin.